The thing I said here is actually a really real thing. Inferno’s usually easy enough to get up and running. There’s some mkfile tweaking, sometimes there are some platform-specific bugs, you’ll have to adjust your path, etc. It can be a bother. It’s definitely worth it, but you can’t tell that until you go through the effort. Downloads that take three minutes are annoying to people nowadays, and this is 10 minutes of tinkering and compiling. I mean, a friend of mine had to harass me repeatedly for me to get Go installed, so I understand your pain. So here it is, Inferno that you can just use without even downloading it. Well, you don’t need to install one. Websockets and canvas tags. You can run it in the browser now by visiting tryinferno.reverso.be. There are more details in another entry. 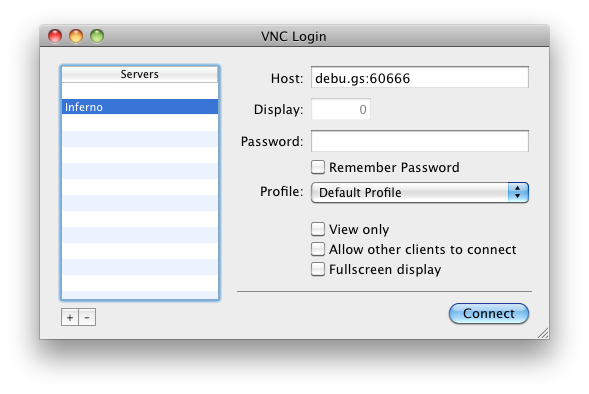 Connect your VNC viewer to debu.gs, port 60666. This is different from the standard VNC ports, so some of them need weird syntax like double colons to specify an actual port. Put debu.gs::60666 into the box where it asks you what host to connect to. 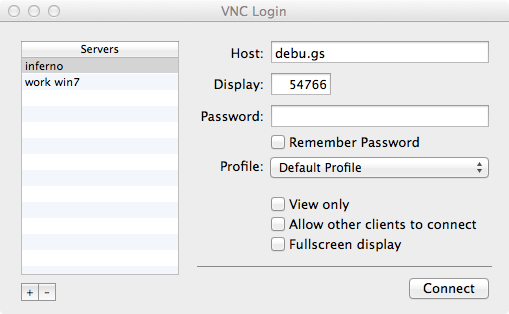 If you’re doing this, I like that you’re using Inferno to get access to a slow, buggy Inferno over VNC. Keep on rocking. I don’t have a Mac, unless you count the semi-operable G5 tower I bought a couple of years ago. It doesn’t have OSX on it, because Apple no longer sells a version of OSX that runs on PowerPC and I’d rather see if I can get Plan 9 to boot on it than convince balky hardware to accept an obsolete version of a closed-source OS. Also the video card is messed up. You’re welcome to try. I could not find any that worked. Also How Does One Implement Such a Thing? The xvnferno script has to live inside Linux for now, in order to get to Xvnc. It starts up a new instance of Xvnc, runs the stripped-down Inferno using that as a display, and then uses the P9P version of dial(1)‌ to hook that VNC server’s socket to the scripts stdin/stdout, which, since it’s run by the Inferno listen command, has its stdin/stdout connected to the network. Obvious in retrospect, but I should patent it! I hacked /emu/port/devfs-posix.c, specifically to disallow attaches to the host filesystem. If you are familiar with Inferno but that didn’t make any sense, I’m talking about allowing #U (which emu needs for the root FS) but disallowing #U*/. I also prevented os from working by tweaking /emu/Linux/emu to leave out the file that provides #C.
I had to tweak some of the colors in Acme, because the monochrome color palette rendered highlighted text and regular text indistinguishable. I made a number of tweaks to /lib/wmsetup, to do some initialization, and then added a nasty hack to make them run only once. I’m too embarrassed to put said hacks here, so you’ll have to look at them yourself. Essentially, that allows incoming connections and forbids outgoing ones, except to localhost. There’s an Inferno registry running on the box, so the people connected can have some sort of voluntary, structured, ad-hoc interaction. Well, I think I’ve got a reasonable expectation that things will stay safe. The VMs are restricted enough that they can’t escape the filesystem they’re in. I also restricted outgoing net access, which is kind of a necessary evil for cases like this where I’m giving out free, anonymous VMs to the general populace. I don’t need my public IP getting blacklisted as a source of spam, or to turn into a node in a DDoS or anything. The main problem this presents is that the way it handles networking is kind of a really important feature of Inferno. It very well might be when you read this! There are issues for scaling here, among other things. The Dis VM has limits for memory usage (to prevent runaway processes). Simultaneously running wm/memory, Tetris, the Mandelbrot viewer with fill off and depth 1000, math/ack to calculate an Ackermann(4,4), Acme, a naive (fib 30) in the Scheme interpreter, a couple of shells, Vixen, and a date widget, the VM grunted and strained and pegged the CPU but didn’t max out the memory for quite some time, and I was able to spawn new VMs just fine, even with the CPU pegged. My second line of defense is to just kill the service and come up with a better first line of defense. Is This the Inferno Room? In case you were wondering what it is you are looking at, that’s Michael Keaton in a green wig, excited and dancing outside an Inferno-themed place of some sort. It was the 80s. You had to be there. Where’s your Map/Reduce thing, turkey? Okay, seriously, though, I need a few days to sit down and hack on it, and I have more or less been working seven days (and a few nights) a week for a while. Getting a consulting business off the ground, as a method of funding some of the more interesting projects. That’s another story, and it might be interesting enough to congeal into a blog post or two eventually, but suffice it to say we’re doing okay but slightly short on sleep and recreational hacking time. Overall, no complaints. So a large part of the Inferno stuff I’ve been doing has been little scripts to do highly boring things like “track billable hours”, “generate itemized invoices” and “make Acme talk to Ruby and PostgreSQL”. Little scripts rather than Big Things like Map/Reduce or getting competent enough at yacc to do a port of awk to Inferno. There might be a blog post in there if I write enough of these little hacks. If you’re interested in a semi-preview, aside from the previous post about building a cluster, there’s Geryon, which is more or less a translation of Google’s Map/Reduce into Inferno. What I’m doing is closer to PVM3, sort of. I’ve posted this on HN. So far, whenever I do that, the resulting discussion is interesting enough to be worth the trouble, so I guess thanks, Hacker News. I got some pretty good feedback! Thanks! I also received CotVNC instructions from a couple of people with Macs (Christian Wright and Christopher Small); I’ve updated the OSX section. Thanks, guys! << Previous: "Interlude: Inferno at Work"
Contact: pete at debu dot gs かたいことは言いっこなし.